If you’re in the market for new wireless earbuds and you don’t want to spend an arm and a leg, we’ve got just the thing. Save your cash without sacrificing sound quality by snagging a pair of AUKEY Latitude Wireless Headphones right now on Amazon. 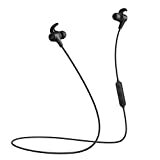 They normally cost $26, with is an incredible price for earbuds with killer sound quality, three built-in EQ modes, and a nifty magnetic clasp that keeps you from losing them when they’re not in your ears. But if you use the coupon code AUKEY003 at checkout, you’ll only pay $18.97. This deal is only good until the end of the week, so jump on it while you can.